Dorset Square was built in 1815-1820 as the central feature of the planned urban layout of the Portman Estate. The square was built on land formerly occupied by Thomas Lord's first cricket ground established in 1787, which vacated the site in 1811. The garden enclosure, little altered since its original lay-out in 1814, was owned by Portman family, its maintenance vested in a private Trust by Act of Parliament in 1813. The Trust levied a rate for its upkeep on residents of Dorset Square, who had the right to use the garden. 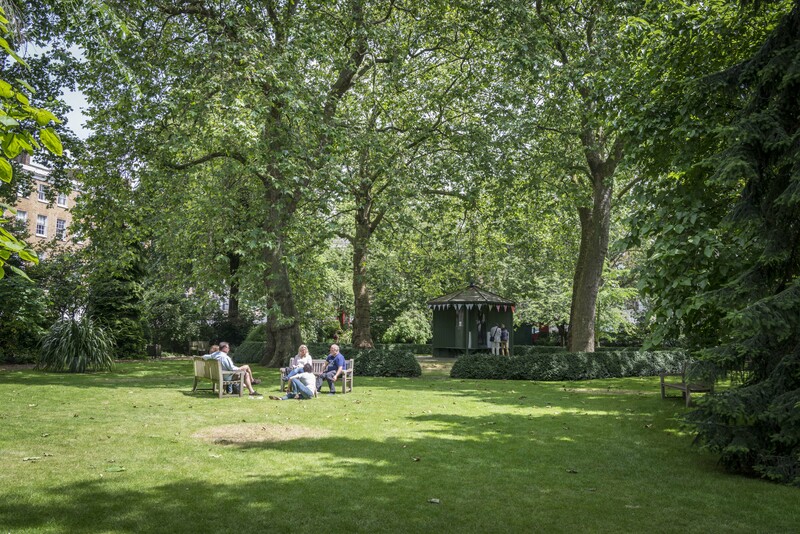 In 1952 death duties forced the Estate to sell the freeholds of the square and it is now owned and maintained by the Dorset Square Trust. LBII: On the east side nos. 1 to 8. On the north side the nos. 9 to 20. On the west side the nos. 21 to 28. On the south side the nos. 29 to 40. Has taken part in Open Garden Squares Weekend 17 times, most recently in 2018. Dorset Square is still architecturally intact and the garden is little altered since its original laying-out. The Portman Estate has a grid pattern hierarchy of square, thoroughfares and side streets. The design of the square has been attributed to the surveyor, Charles Day. The garden was laid out in 1814 on land formerly occupied by Thomas Lord's first cricket ground, home of the Marylebone Cricket Club, established in 1787, which vacated the site in 1811. Progress on the square was slowwas slow; by the time of Horwood's 1819 survey only 4 houses had been built. Three houses on the east side have original ironwork verandas on the first floor, overlooking the square. The garden enclosure remained in the ownership of the Portman family, but its maintenance had been vested in a private Trust by an Act of Parliament in 1813. The Trust levied a rate for its upkeep on the occupiers of houses in Dorset Square, who had the right to use the garden. In 1928 it was described as 'an oblong area surrounded by low, sparse privet hedge', 'an attractive open space with well-kept lawns and some fine trees'. In 1952 death duties forced the Portman Estate to sell the freeholds of the square, that of the garden going for £100. The Trust that continues to maintain the garden collects a rent from the residents of the square towards its costs. Peter Potter's survey of the square for the Portman Estate c.1820 shows an oval surrounded by a shrubbery bed containing a symmetrical circuit walk. Within the walk was a symmetrical arrangement of five central clumps and four small ‘corner' beds, the lawns scattered with smaller shrubs and trees. The planting and path layout still closely resemble Potter's survey. The perimeter planting comprises mature London planes, underplanted with shrubs and trees now including holly, cherry and magnolia. The central clump, now of four mature London planes, also contains a modest wooden shelter. At the eastern end there is an attractive wooden kiosk, and the square is completely bounded by the railings. Former residents of the square include Sir Laurence Gomme (1853-1916), early pioneer of the Blue Plaques Scheme who lived at No. 24 from 1895-1909, George Grossmith, co-author of The Diary of A Nobody, and Dodie Smith, author of 101 Dalmatians, the houses marked by Blue Plaques. Despite the lack of change to the square itself, the build-up of traffic on the neighbouring Gloucester Place has had an impact on the square's character; the shift in use of the surrounding houses from residential to business may also come to threaten the square's viability.